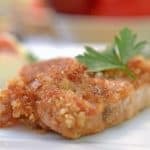 Apple Butter Dredged Pork Cutlets – We are experiencing apple-mania this fall, here on Platter Talk. In case you are wondering about the specifics of that particular condition, it is characterized by an unusually high use of apples in the kitchen. Due in part to the unusually large harvest of apples from our honey crisp tree this past weekend, readers of this site can expect this affliction to continue for quite some time. Our recent obsession of cooking and baking with apples has been further heightened by a jar of apple butter sent to us, compliments of Musselman’s. Our challenge by them was to put it to good use and to that end we are having a delicious time. You may have read about our Scottish Tea Cookies with Apple Butter which was our first recipe for which we dove into that challenge. 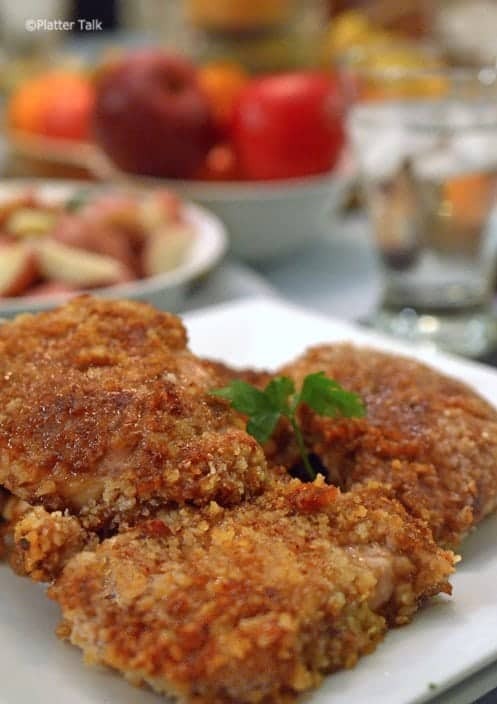 This post features the next one we created and it is every bit as mouthwatering as the first: Our Apple Butter Dredged Pork Cutlets. We put pork together quite often in our kitchen. It’s economical, it’s versatile, and perhaps the most important reason for Scott and me, the boys chow it down, giving their dads assurance they are getting some sound nutritional intake (in this case namely protein) in their diets. I’ve mentioned before that Scott takes care of the majority of the grocery shopping in his house. The reasons for this are many, chief among them being he is an excellent shopper and has a knack for finding great deals without sacrificing quality. I’m convinced that he can buy for $60 or $70 what I would spend double that amount on and still make it last most of the week. One more reason (among hundreds) that I’m a lucky guy. 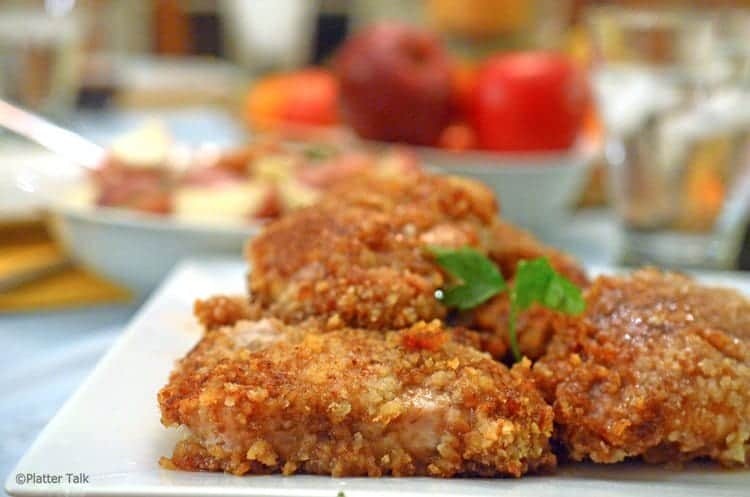 Getting back to these apple butter dredged pork cutlets, they are PDD. Pretty darn delicious. The technique could hardly be more simple. Apple butter is used in lieu of eggs for a standard breading (dredging) technique, providing a sweet appley coating to which an outer layer of breadcrumbs can adhere. Make your own apple butter. It’s easy and delicious! 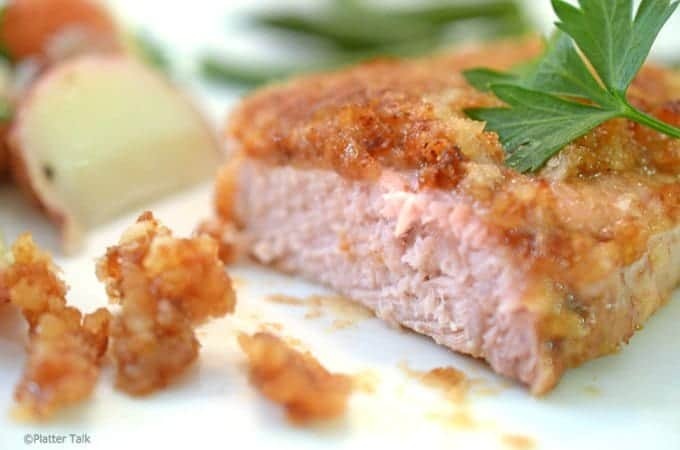 4-5 boneless pork cutlets abut 1.5 lbs or 3 kg. Using standard breading technique, dredge each pork cutlet in flour, apple butter, and bread crumbs. 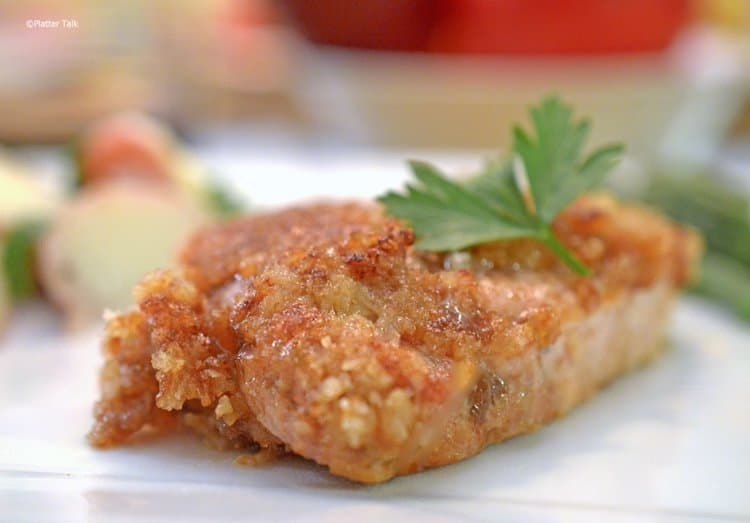 Place each cutlet on clean plate or cookie sheet until ready for next step. 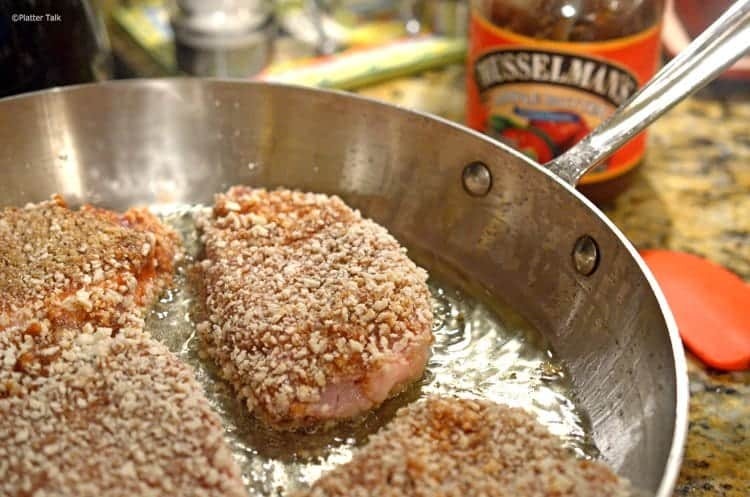 Over medium high setting, use large oven-safe skillet or sauté pan to heat oil. Place each cutlet in hot oil, and brown each side for about 2 minutes. Place pan in oven for 20 minutes or until meat has reached minimum internal temperature of 145 degrees. Allow to set for 3 minutes before serving on warm plates. Dan, our parents had 10 kids and 6 of them were boys, she taught everyone how to cook. It’s the best thing I remember doing with my Mother, your recipe looks awesome I am making it tonight. I am always looking for new dishes to try, all my friends say I ought to open a restaurant. I keep telling them I do this because it’s not work, When it becomes work I will learn to hate it. Thanks for the great comments, sounds like you grew up with a bunch of lucky siblings and a great mom. These look divine! I’d never have thought to use apple butter as a sauce! Sarah, I hope you’ll try these. They’re easy and delicious and I have a feeling you will just love them. BTW, I love your name. It’s the same as my mom’s and she was every bit the beautiful princess that both your names denotes. Super delicious! I am sure the pork stays so moist cooked this way. These look so tempting and succulent. Just love the flavor profile you have going on. A match made in heaven! 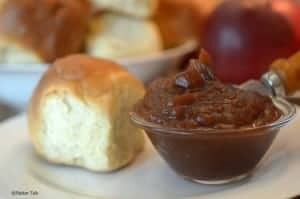 Apple butter is so versatile, a so handy for using in cooking. Apples with pork, are perfect together. Lovely hearty meal. Another amazing recipe!! I know apple goes well but i can bet the apple butter was awesome. Can’t wait to try . We eat pork about once a week around here..and I’m a huge fan of pork and apples together so I love this easy combination 🙂 thanks for sharing!